The Project Pad • View topic - AAN manifolds flange 07k same???? Are the manifold flanges the same on both engines????? Re: AAN manifolds flange 07k same???? The flange won't work due to the injector recesses in the AAN/3B/7A head you can clearly see above. 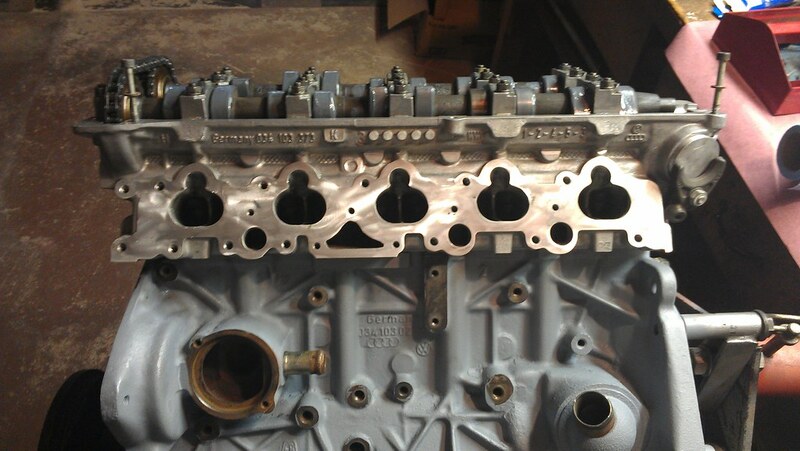 However, the port spacing is the same, as is the 1.8T, which happens to share the same injector mounting setup, port shape, and bolt pattern (albiet with the 07K only having about half as many threaded holes from the factory). Also, based on all your posts it seems like you're trying to do some sort of longitudinal 07K on the cheap, and just as an FYI unless you can fab pretty much everything (and don't count your own time), there isn't really a cheap way to do it. Also the 07K intake ports are substantially wider... I can't remember if they're also taller. On the exhaust side, the "old school" 20V engines had the ports unevenly spaced, whereas on the 07K the spacings are even. So an old exhaust manifold won't work.